This time of the year got me thinking about a decoration I remember at the old, long gone Sears in St. Matthews. Since I was a small child at the time it seemed like it was a gigantic Santa with his sleigh and reindeer atop that covered thingy on the sidewalk leading out into the parking lot. Was it really that big? And how about the outdoor slide that I think might have been at a department store in Hikes Point? (Consolidated or K-Mart. maybe?) Was it as huge as a child's mind remember it? Also, to offer a contribution, Ayr-Ways were preceded by L.S. Ayres and owned by the same family. I recently spent my last week of vacation this year sick as a dog. While bedbound, I started posting pics of old stores on my Facebook page and asking my friends to remember the locations. Here are a few we came up with: Topps, Arlen's, Ayreway, Almart, TG&Y, Roses, Woolco, Consolidated, Britts, GES, Pace, and Grants. Does anyone remember a place called Shopper's Mart? It was on the order of a Peddler's Mall, only not as junky. My stepdad was a metal artist and had a booth there. For the life of me, I can't remember where it was! My cousin, Jerry Wimsatt, was the manager of the Topps stores. I LOVED Almart on Preston! Wasn't Ayreway what Target is now? Loved the good old days! I miss Bacon's! I was around 8 when it closed, but I remember it being way better than Dillards. Also, There's a re-purposed shopping center at 6201 Preston Hwy in Okolona which is now a Big Lots and a Unique Thrifts. Does anyone know what this was originally? The center itself looks like it was built in the mid 60's or so, but I'm just guessing on that. I had originally theorized it was an Ayr-Way, but if there was one on Preston it would have been the old Target up the road instead. Thanks to anyone with info! On another note, I remember the Kenwood and South Park drive-ins fondly. I saw Babe at the Kenwood and Pocahontas at the South Park. I guess the tie-in between these stories is that the shopping center where Children's Palace was also used to be a drive-in, called the East. Here's a photo, along with Shelbyville road plaza. 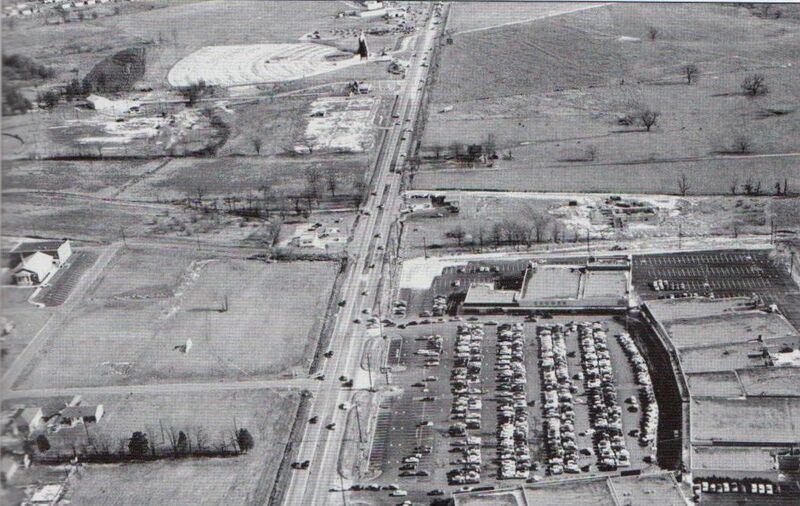 Check out that farm where Mall St Matthews is now! Baer's Fabrics closed before I learned to sew. I would be THRILLED to find fabric like what they had now. Also, the trolley that used to run in St. Matthews. I think it was mostly for the malls. The store on Preston was Consolidated Sales Company. I grew up on west side of Louisville Memorial gardens cemetery......remember the old conveyor at Dixie manor at the grocery store on the south finger of the center. Also fond memories of the old Bacon's shopping center. When we were kids my friends and I would walk or ride our bikes through the cemetery, cross a large ditch with a huge drain pipe that drained the parking lot (we were adventurous and sometimes would enter this drain pipe and follow it all the way to the center of the parking lot above). We would buy BB's at either Western Auto, the hobby store or Kreske's 5 and dime then we would make our way to Bacon's and ride the escalator until the manager would throw us out. Usually the next agenda was to stop at the old Taylor Drug's and look at the "MAD" magazine, then we would visit the Shively record store at the very south-end of the center and pick up our Top 40 list of what was playing on WAKY or WKLO radio. Great memories!! Jim C.